Here is your workout for Family Day Monday. If you can't jump or can't do jacks for that long then modify them to step out and in but keep arms moving and the lat 10minA, if you can't get out and run/treadmill, then combine running up/down on stair, walking lunges and squat jumps for a total of 10mins. 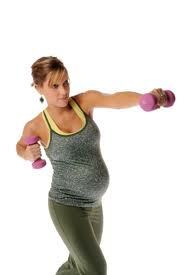 Many women, especially first time moms, hesitate on keeping up with their workout regime while they are pregnant. There are many different reasons why women are nervous but I'd just like to talk about how beneficial the exercise is for your body AND your baby through pregnancy. First of all, if you currently workout you understand the sheer mental, emotional and spiritual benefits to exercise. it keeps you focused, grounded, positive and feeling strong. All these aspects are just as important if not more when you are pregnant. Cardiovascular exercise (anything that increases your heart rate and keeps it up for an extended period of time) is amazing to help with weight management and to keep stress levels down, lower blood pressure and to make you sweat! Strength training will help you keep your muscles working and firm as well as supporting your joints as your belly get bigger and your weight shifts forward. Posture is VERY important to reduce back pain and to keep a strong core. A strong core and muscles overall will also help during labour. Yoga/Meditation is also an incredible form of exercise during pregnancy to keep muscles stretched and to teach breathing techniques that can be used in labour. Also, meditation can be a VERY beneficial tool for those women that struggle with high blood pressure or managing stress. So as you can see, there are MANY benefits to exercise during pregnancy and there are many more than I have mentioned as well. One of the biggest things you want to remember is just to keep active, eat healthy (don't fall into the trap that you are eating for 2, your body only needs an additional 300cal/day while pregnant) and go by how your body feels. There will be days that you are more tired and give yourself permission to take it easy on those days. There are also certain positions and exercises that you should not be doing after a certain point in your pregnancy, like lying flat on your back or holding your breath while you do anything! Also, when doing core exercises stick to plank and side planks, no crunching or crossover motions, these will add pressure from the inside pushing outwards on your abdominal muscles which can create or increase the size of a diastasis (the separation of the abdominal muscles). So stay active and have a great pregnancy!